My Potatoes. I actually did eat slugs once, on a survival course. The instructor recommended skewering them on a twig, then cooking them over the fire so they wouldn't be slimy. They tasted of soil, with the texture of old inner tube. I suspect that's why they never made it onto masterchef, yet if you were really stuck, they'd feed you. Many years ago, when a young teacher in a rural secondary school, I accompanied a group of 15 to 16 yr old school leavers on a "careers" visit to the local meat plant. The lads were interested to see what happened to the beast they reared at home. But when we entered the room where the heads were being split open to allow the brains to be extracted, and when the boys heard this was a delicacy for export to France, they were disgusted! (This was pre-BSE) Food? Logic??? For myself, seeing the slaughter/butchering process didn't put me off. It did raise my awareness of the realities involved in being a carnivore, though. go about composting the wool ? To compost wool, bracken must be added and is a very slow process and labour intensive and needs intense heat. Wool takes a long time to break down and cutting it up is a nightmare. It has very good water retention properties and is high in nitrogen. Probably best used to line hanging baskets. There is a product on the market called slug-gone. It's sold in Ireland by David Brennan. I get a 20 KG bag (€35) from him once a year to use on my hostas and some select plants that are susceptible to slug and snail damage. 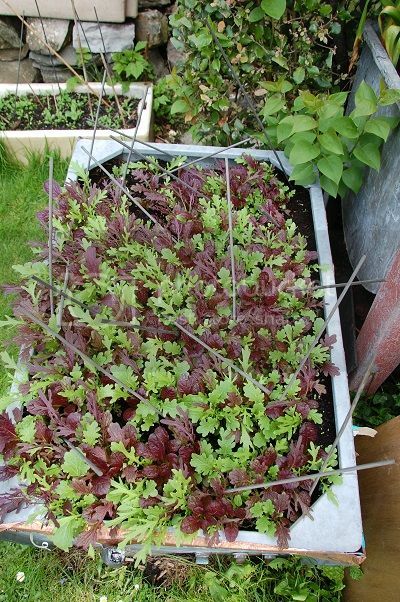 It works well especially at the start of the growing season when there are lots of fresh green shoots and little else for slugs to eat and it needs to be replenished after about two months. However if you get a wet Summer it is ineffective as the water tends to pool on it and the slugs glide right across. Another product that is really effective on slugs are nematodes sold as Nemaslug. I used it where I had a problem with slugs eating my potatoes and for the years I used it nothing was touched. I have not grown potatoes for the past two years due to work pressures not allowing me to find the time. Copper tape around containers works also I did it for the first time this year and so far the results are positive, none of the oriental mustard has been touched by snails. The sticks you see in the picture are to discourage cats from digging up seed and destroying the crop. I have not tried the electric fence yet. Other things that help are removing the cover for them to hide under. Beer traps I've found to be ineffective all they tell you you have slugs in an area, but you can already gauge that from the damage done. Also they don't go for Dutch Gold, more expensive beers seem to attract a few of them. If you want to use pellets and I still do for new bedding plants, then create a cover with a large stone or slate cover nearby with enough crawl space and put the pellets under that. You do have to go around and clear them away afterwards. Pellets only get percentage of the slugs. A particular problem I have in this garden are snails, during the Summer evenings around 10PM or earlier if its wet I go around with a bucket and pick them off, typically get around 30/40 of them in an evening and let them die in boiling water. After about mid Summer I just let them be they can process the dying plants also there are quite a few around the compost heap I leave alone to do their thing. Crushed mussel shells, very sharp sand with broken shell, holly leaves. They all help. 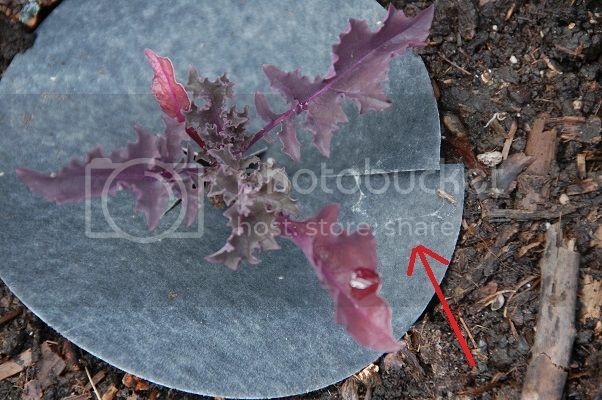 I tried cabbage collars for the first time around some kale and broccoli plants as you can see from the slime trail the snails made a go for it but backed off. Mews - does your supplier have a website for ordering? I watched the video by the Scots fella but, when I clicked on Dave Brennan, I found myself needing to be on Facebook. On a matter of principle I will not go on that or any other social media site so would like an alternative. I get my supplies from him at the ISNA shows. You will find his contact details on the ISNA link so you can check with him if he'll be at a show near you. He does not do post and packaging (how many couriers want to carry sheep sh!t). In the USA some garter snakes will eat slugs. Obviously not a runner here. Thanks for that, Mews. It transpires the nearest ISNA event to me will involve a 100+ mile round trip so not a realistic option - but the thought was there. One would think that it would kill both species seeing as they are so similar but then the name gives it away too I suppose. Mews, thanks for those videos. Aren't the ducks some crack? I encourage lots of birds and I also have a large frog population. I always did, even before my wildlife pond. It's a long time since I've seen a hedgehog in the garden but I provide plenty of shelter habitat for them so they may well be there. I do have slugs, of course, but they're not a major problem. And thrushes love the snails!